10/12/13 - Xtasea checked in form the their trip south. The Sea Log of the USS Narsilion…. Closed hauled sailing in a cool breeze of 12-15 knots all night long. Hi to all our friends in Northern Star Hunter Sailing Assn.! Hope that you all have a happy Memorial Day weekend and raftup. Unfortunately we're only in South Carolina now and won't be able to join you but we'll be there in spirit. We crossed the Gulfstream May 7-8th and worked our way up northern Florida, all of Georgia and beginning of South Carolina. As we have an insurance mandate to be "north of Cape Hattaras by June 1st", we've been moving more and anchoring out mostly. Don't mind the 10-11 hour days but we set a record Thursday: 90 miles in 13 hours. Cath was feeling that one! We hope to briefly visit sailing friends in New Bern, NC and also friends in Washington, NC after we pass the Cape Hattaras line. Then we can slow down a bit and enjoy ourselves more with scenery and stops. Don't eat too much! Hi all, just a quick email to let you know we're back in Marsh Harbour again, resting up from 3 storms in 4 days. First one was a biggie, our buddyboat lost their anchor & chain. We're still going to try to search again for them, after they get their replacement anchor in. We're loving the sunny weather, not the high winds & storms. But can't really complain. Been doing things with boat friends, had a "Turtle Racer" drink at "On the Beach", in Hopetown. Going to try to replicate it sometime soon, know ingredients, not quantities. Thinking about moving north about first 1/2 April to think about getting back to US & up the East Coast. No hurry, mon, but thinking. I miss family & friends. First let me preface this by telling you that my husband & I are getting back together. This is moving week as closing on the Fort Scott house is Friday morning. Needless to say, I'll not be moving to the Baltimore area. Guess I'll just have to continue to miss the bay. Thanks so much for forwarding a copy of the Portlight, though I don't have much time to read them. In fact I haven't been on the boat since late April! Haven't even finished spring commissioning yet! Self-employment in a construction-related business gets busy at the wrong time of year. This next question may have already been covered in a Portlight, so please forgive me if it's redundant. I was eating my oatmeal this morning (before going to work) & perusing Yachtworld - a favorite pastime - great daydreaming stuff. I was looking at Hunters & saw a Passage 42 (one of my all time favorites) & saw one for sale in Houston. Well imagine my surprise when I clicked on it & on the transom I read Columbia, MD & it's name was DREAM CATCHER!!! Whats up? Hope you all are doing well & having a great season in spite of the rain. Say hello to the oldtimers for me. Sure think of you all & the Bay a lot. Seen on the Chesapeake Bay. Dream Catcher will return to the Bay in 2007 to be sold. This will be the last "Cruise News" as we now are spending most of the year on shore. Next year we will return to the traditional Christmas cards and conventional mail. We spent Christmas 2005 in our new home in Texas with all of our children and grandchildren! Life on the boat the past seven years has been fun, but nothing compared with hosting a Christmas gathering of the clan! Our boat, Dream Catcher, was in a marina here in League City and did not get much use until this November when Ben and several sailing pals took it to Florida. We will be sailing to the Bahamas for the rest of this winter after the holidays. 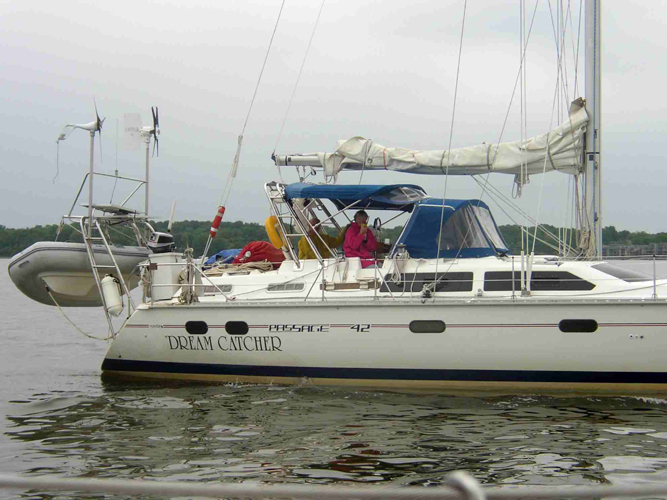 In the spring we will return to the east coast of the U.S. where we will leave the boat with a yacht broker for sale. During the winter of 2006 our days were busy with gardening and decorating of the house. Nancy acquired a sewing room and produced drapes, bedspreads, quilts, etc. Ben kept busy with hanging pictures, planting fruit trees for Nancy, and assembling and moving furniture about, but still found time to go down to the marina and fix things on the boat. Because our son and his family (Jim, Jacqueline, Nicholas and Kendall) live 15 minutes away, we spend as much time as we can with the grandchildren (now 8 and 5) and have a room at our house for them (and a desk in the study for their "office"). Ben also went through a training program in the spring to become a certified volunteer ombudsman (CVO) for the Texas Long Term Care Program. He spends a half day each week visiting residents in a local nursing home, assisting them with their rights, helping to resolve complaints, and counseling them on empowerment to improve quality of life and their care. Being a CVO is not always fun, but it is a necessary function and does have its own rewards. It also provides a window on "our future selves." In the spring Nancy flew to Charlotte, NC, twice to help her brother while he had heart surgery. It was successful and he is recovered. On May 1st our second granddaughter, Macy Scriven, was born in Providence, RI. We flew up to RI for the event and to help Macy's brother, Miles, adjust to having a sibling. In June we drove east by land and spent two and a half months on the road visiting friends and relatives in New England, Delaware, Maryland, Virginia, the Carolinas and Florida. We rented a small house on the water in Portsmouth, RI, to be close to Karen, Michael, Miles and the new baby for the month of July. We also had our eldest grandson, Kiel, who had just turned 13, stay with us for the month of July. He served as a junior counselor every morning at a day camp in Karen's community, and worked on his tennis in the afternoons. In August we visited friends in Maine and with Ben, Jr., Robin, and Kiel in New Hampshire. Then we headed south, stopping again in Maryland before heading to the Shenandoah valley of Virginia for a week at the Massanutten Resort. Friends from the Chesapeake came over to Massanutten to share the time with us and we kayaked, played tennis, mountain biked, and hiked. We then stopped in Charlotte with Nancy's brother before heading down to Jacksonville to spend time with two of Ben's brothers who now reside there. We returned to Texas on Labor Day, but found it still very hot, although blessedly free of hurricanes this year. 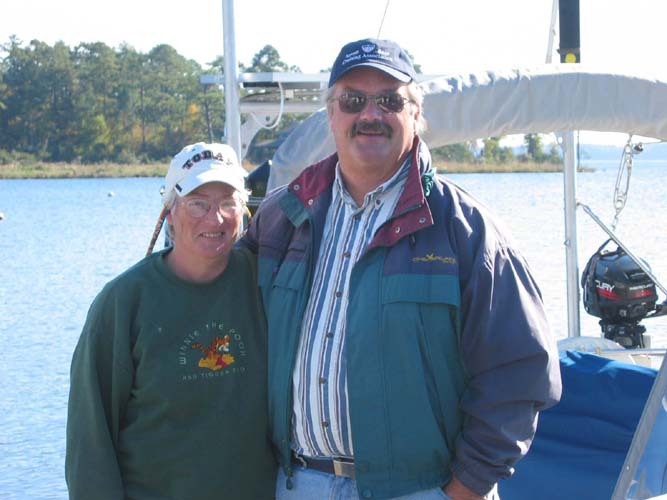 We had decided to sail to the Bahamas for the winter, but we wanted to get the boat to Florida in early November (after hurricane season) to have it ready for an easy crossing to the Bahamas in mid-January. We made the boat ready during October, planning to set sail the first of November. Our daughter, Karen, called in October to say that she was flying to Nepal in late October to help the Mercy Corps field staff with their annual meeting to review progress and new program planning, and asked Nancy to fly up to RI to help Michael with the children (Miles was then 3 and a half years old, and Macy 6 months). Although we could have waited until mid-November to take the boat to Florida, late fall weather on the Gulf of Mexico can be unreliable, so Ben recruited two of our Chesapeake sailing buddies to help take the boat from Galveston Bay to Tampa Bay. For Nancy's birthday this year we flew to Puerto Vallarta for a week at the Mayan Palace Resort. It was a lovely vacation, with absolutely perfect weather, good food, and fun activities. We plan on making trips to Mexico at least annually, as it is so convenient, and we always seem to have great times. Perhaps we can meet some of you, dear readers, on our next Mexican excursion? What is next for us? We will spend this Christmas here in League City with Jim, Jacqueline, the grandchildren and Nancy's brother. In January we will fly to St. Petersburg, then sail down to the Florida Keys, then cross over to the Bahamas. We hope to see Karen and family and eldest grandson, Kiel, in the Bahamas, and perhaps some old friends. We will return to the U.S. in the spring. Next summer we hope to rent a house again in RI and will see our New England friends and relatives. In the fall of 2007 we would like to do more land travel in Mexico, perhaps spending time along the coast in Mazatlan and in the Sierra Madres visiting old mining towns. There are two guest bedrooms in our home and we hope that you will help us keep them filled. Have a very merry Christmas and a happy peaceful and prosperous new year. Fair winds and calm seas. I thought that some of you might like to see the position reports from Ben Duggar sailing with his crew of Gordon Palmer and John Molnar. They are taking Ben's boat, Dream Catcher, across the Gulf of Mexico from Texas to near Tampa, Florida. They have had a time of it with the wind and seas remaining high, and against them, but they have the end in sight. We left Wednesday [1 November] evening to make use of a north wind. Had a great first 24 hrs. Now we are beating into high seas and strong winds from NE. Winds forecasted to go South tonight, but till then it is rather rough. Some seasickness aboard, everything also wet. At 4pm EST we were at North 26 degrees 44 minutes, West 88 degrees 46 minutes. This is about 300 miles west of Ft. Myers. We had a 36 hour prediction of NE winds when we left -- starting at 15 knots and building to 25 overnight. We had 60 hrs of NE winds with a gust of 37 knots observed. Now the wind is east at 25-30 and we have to tack towards the NE. This is adding many miles to our crossing, but we cannot appease the wind god sufficient to send us the south wind promised for last night. Perhaps tomorrow night? The crew is eating a little, but pretzels, cokes, water and fruit are about the only things. Still very wet, but thank heaven for the enclosure panels!!! It is warm (79 right now) so though wet it is bearable. Hi, it is noon and our position is: 27 degrees 55 min. north, 87 degrees 51 minutes north. The forecast is for the current conditions to last till tomorrow morning, then to weaken with the wind beginning to clock to the SE in the pm. We have decided to tack and head SE for the rest of today so that when the wind starts to clock we can clock back and head east closer to St. Pete. Nice and sunny today, though still wet from big waves and 20-25 knots of wind. Our departure forecast of 36 hours of NE wind has now reached 120 hours! At 11 am we were at 27 degrees 23 minutes north, 86 degrees 41 minutes west. Over the past 48 hours we have averaged a touch over 60 miles/day towards are goal. The first 48 hours we averaged about 160 miles/day towards our goal. We still have 20-25 knots of wind right on the nose, but tomorrow it is supposed to go to the SE and drop to 15 knots (same thing we heard Fri, Sat, and Sun). If it follows NOAA's model this time we could arrive on Wednesday. We are about 200 mile east of St. Pete. We tack about every 16 hours, but make little headway because of the seas. Some eating on board, but impossible to cook anything. We have a steady list of things that have broken. Everything inside is a shambles and wet. Hard to keep up spirits, but essential that we endure yet another 12-24 hours of dreadful pounding. No serious injuries on board so far, but lots of blood from one minor scalp wound. Sorry to sound so grim, but we just read todays grib file which we all had hoped would say the pounding stops today -- disappointment is king for the moment. We are at 28 degrees north, 84 degrees 21 minutes west, about 85 miles west of St. Petersburg. Currently 25 knots of wind on the nose, large seas. Still rather wet. We did have a brief respite early this morning with only 20 knots and a wind shift for 3-4 hours. Had a visit from a CG Rescue plane yesterday. He circled us for 15 minutes checking to be sure all OK. Asked if he could do anything for us so we asked for 10 knots less wind and much smoother seas, but he no could do. We expect to see lights on shore before dawn. Not sure if we can beat far enough south to make our intended channel entrance, so may have to come in further north and go down ICW 10-15 miles. Just after Tuesday's position report a violent front moved through (35 knot winds on the nose and goodly waves), then two hours later we started motoring. Wind went to 5 knots, seas still high from left overs, but decreasing rapidly. By 2 am Wednesday morning we pulled in behind Egmont Key at the entrance to Tampa Bay, had a celebratory feast of cookies and milk, then went to bed. Just had bacon, eggs, muffins, orange juice, tea and coffee. All is well. We have about an hour and a half to go to the marina. Will leave for the marina after changing fuel filters (things got shaken up in the fuel tank this past week). Amy and I visited Windkist outside Washington NC last Saturday. 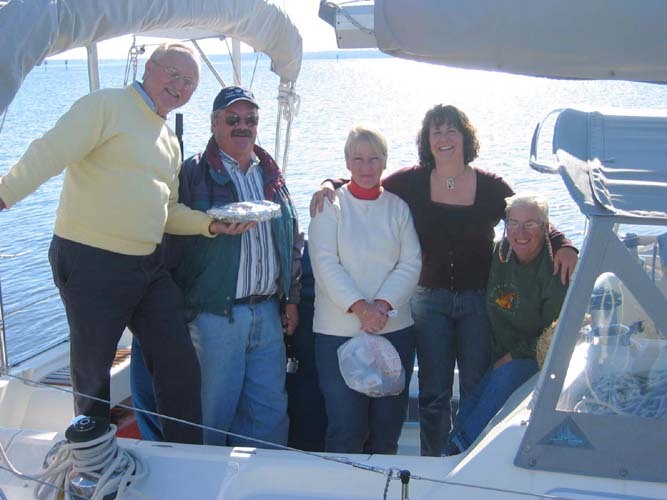 Garry and Catherine were staying with their friends, Jim and Joan Sweeney in Pamlico Plantation. We spent the day on Windkist and at the Sweeney's house with the group. We had a nice dinner out in Washington, with Amy's home made apple pie for desert. After the ice on their decks thawed, they left early Sunday morning for Oriental. Garry and Catherine are doing great, but would sure like a little warm weather. Here are a couple of pictures of the group. Just to let all know that we are dropping our sailmail account and going with svseawitch@yahoo.com. We still have our Grenada phone 1-473-406-7341 dialed just as though you are calling in the U.S. no international code required. Well, we've become a few steps closer to being permanently attached to Grenada. We met with an attorney last week and have started the very long, rather involved process of applying for permanent residency. ( Not cheap, either). It may take 2-5 years to get approved, or could happen the week after they receive the application. Make sure you include the "Grand Anse"...that is the post office where our box is, rather than the central post office or one of the others. Our little area where we live is going to be developed. They are supposed to put in a golf course, hotel complex, and villas, all around us. They will build a bridge over the cut where we take the dinghy through to get to the car, and the marinas and restaurants in Woburn. We have taken the "Sea Witch" and several other boats through there on a regular basis, but the plan evidently includes a walkway which will not even allow us to get the dinghy through! We will be checking e-mail more frequently as we now have free Wi-Fi available. Just a short dinghy ride to the little marina/restaurant (Whisper Cove) owned by one of our closest Grenadian friends, and operated by some Canadian friends (for all of you ex-Hog Island folks) Phil and Shelley with their two little girls, Sara and Melinda off of Fool's Wisdom. Times change....but we still love Grenada.